Experience our iPhone XR bulletproof glass live and in action on our YouTube channel. You’ll also find videos about our new iPhone XR Screen Protector Hybrid and iPhone XR Screen Protector 2.0 4D here. 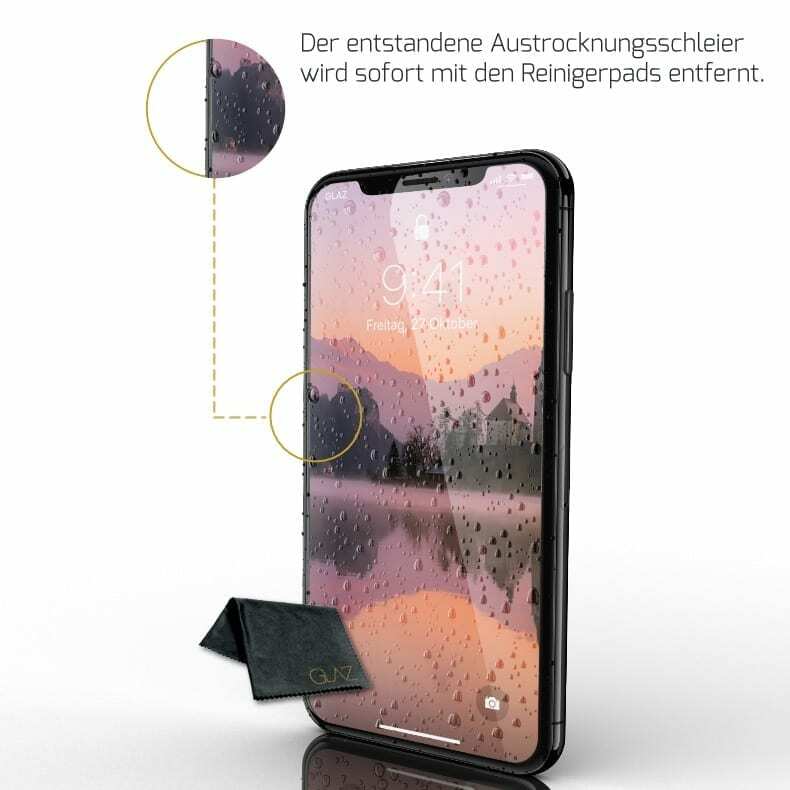 Our iPhone XS protective film Hybrid impresses with the unique combination of real glass and composite materials. In a 3-layer process, three layers of liquid iPhone XR screen protector are applied to your iPhone XR display. The layer thickness per layer is only impressive 1.5 microns, so together 4.5 microns. Thus, the innovative bulletproof glass film optimally adapts to the iPhone XR design. Buy the Liquid 2.0 for the iPhone XR now. Our liquid screen protector also protects the screen from scratches beyond sensitive edges. Thus, the liquid iPhone XR screen protector offers optimal protection with 100% screen coverage. Furthermore, the Liquid 2.0 is 100% invisible and annoying edges, like a normal iPhone XR protective film, are a thing of the past. Thanks to the unique 3-layer process, the iPhone XR armored glass reaches a breathtaking degree of hardness of 9 + H. This degree of hardness is reached after the drying phase of only 10 days. However, the Apple smartphone is ready for use immediately after the installation of the liquid screen protector. Due to the use of 100% liquid glass, the Liquid 2.0 offers an invisible, hard protection against scratches and other damages. 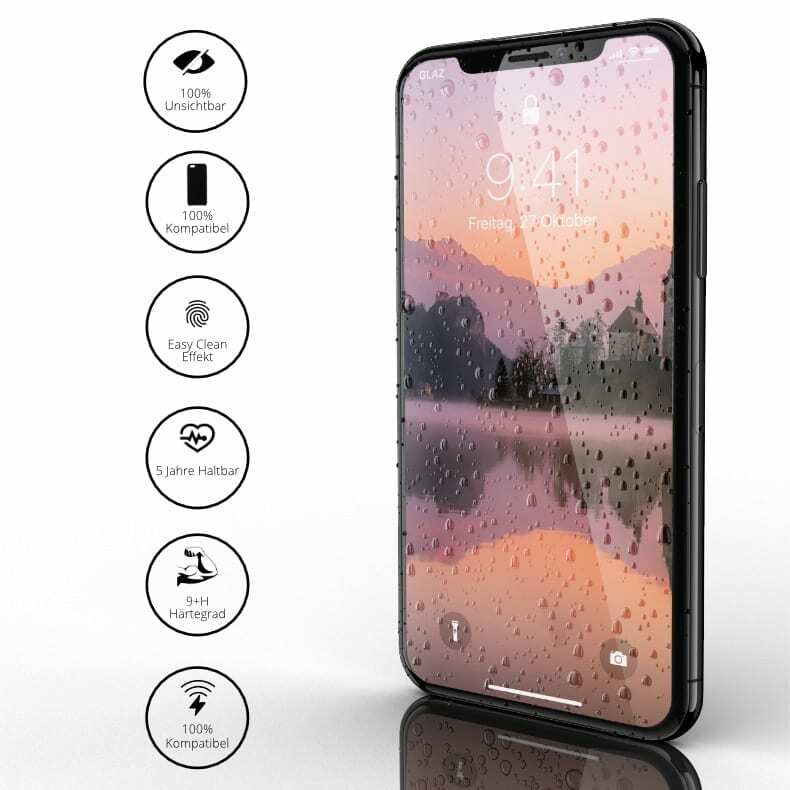 With our liquid iPhone XR bulletproof glass, you no longer have to worry about annoying air bubbles or dust. Even after installing the iPhone XR screen protector you will experience the full color brilliance of your OLED display. In addition, the elegant iPhone XR design is preserved. 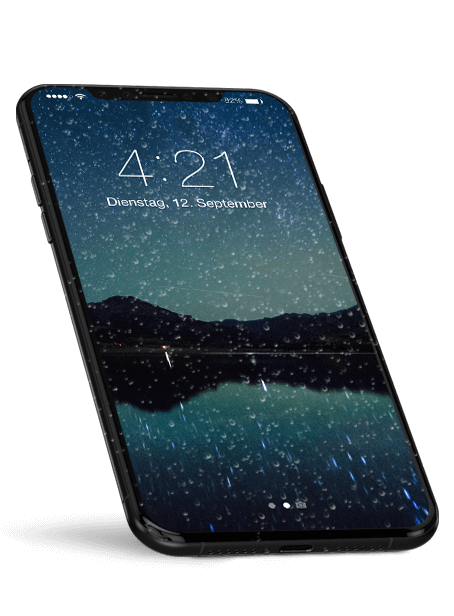 With our liquid glass protective film, you make your iPhone XR display waterproof and can thus safely use your Apple smartphone underwater. With a shelf life of up to 5 years, our Liquid 2.0 Liquid Screen Protector lasts longer than a conventional iPhone XR protective film. Accordingly, the liquid iPhone XR bulletproof glass offers a plus in screen protection, as you not only save money but also time. Finally, you save yourself the regular purchase of an iPhone XR screen protector. The thin iPhone XR armored glass design lets you continue to live your own lifestyle and choose your accessories. Due to the low glass thickness of 4.5 microns, every iPhone XR Case fits, even a thick, large outdoor shell. In summary, our liquid screen protector is extremely sleeve-friendly. If you buy an iPhone XR screen protector from GLAZ, then you do not just buy any screen protector product. Because especially for the liquid bulletproof glass we have created an illustrated installation guide as well as an installation video. Furthermore, our German support will help you not only by mail, but also on the phone with questions about our products. Our GLAZ Liquid 2.0 is pure screen protection innovation. Because our liquid iPhone XR protective film is different than all screen protection products, as it has on the one hand a liquid bulletproof glass shape and on the other hand to 100% real glass instead of nano-coating sets. 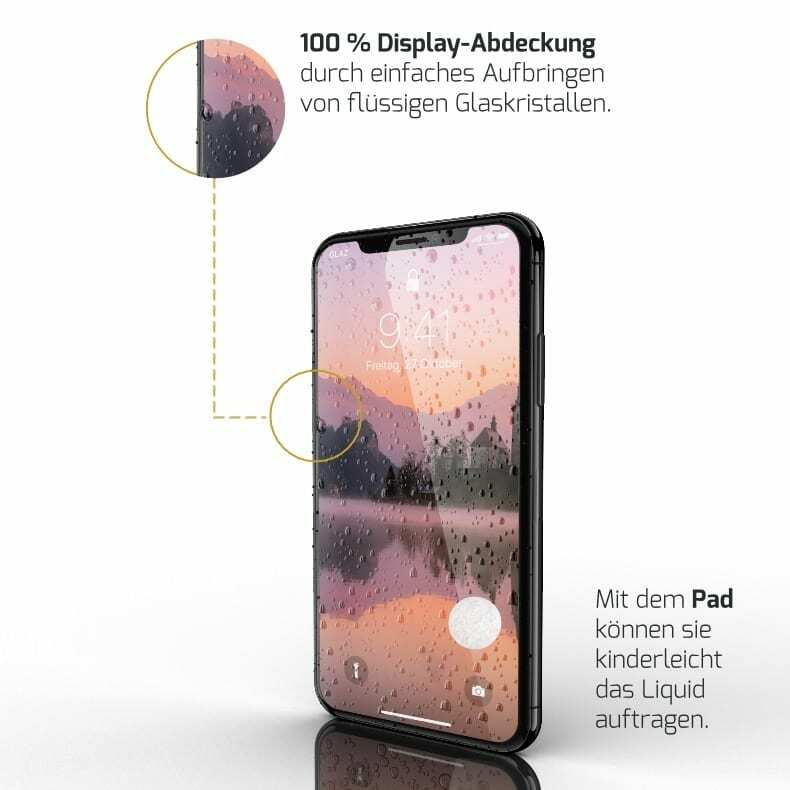 After all, our liquid screen protector is more than just protection, as it does not touch the iPhone XR design and the perfection of the smartphone, it supports it. Protect the new Apple iPhone XR from the very first second, because damage to the expensive mobile phone can occur at any time. This is also the conclusion reached by the YouTube star TechFloyd, who has already installed and tested the liquid iPhone XR protective film on the iPhone X.